It's a big ol' lovefest with these three right now. But who's most likeable? Bo the presidential pup: Off-the-charts likeability. The Q score is a shady rating that "measures" a celebrity's appeal with the public, and is more or less used to determine their marketability and dollar value. Or something. (Variety explains it nicely, if you're really interested.) Three celebs are duking it out this week for America's heart -- who's winning? PAUL RUDD: As if his turn in I Love You Man and Entertainment Weekly branding him "The Most Lovable Leading Man on the Planet" wasn't enough, he went on Sesame Street, dressed up like the globe for Earth Day, and did the white man's overbite with Elmo, all of which makes us want to eat him up with a spoon. LINDSAY LOHAN: She'd managed to dethrone Paris Hilton as the most grating celeb presence in recent memory -- but then she and SamRo broke up (sorta?) and she made this spoofy eHarmony ad, in which she's seeking "a compatible mate who likes a night out on the town, ankle monitoring bracelets, and doesn't have family members who are quick to issue restraining orders." So she's smart and hilarious now? Like back in the Mean Girls days? BO THE PUPPY: Admittedly, most puppies are fairly cute. 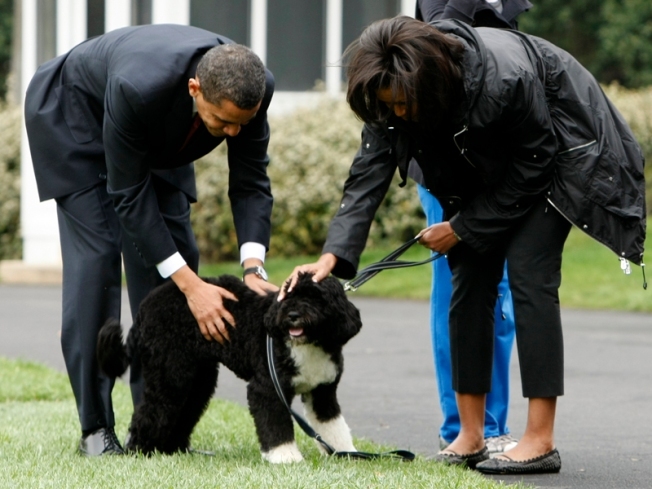 But Bo the Portuguese Water Dog -- the most anticipated arrival in the White House since, well, his owner -- is all scampering through the West Wing halls, wearing Hawaiian leis, and showing off those two white socks. As opposed to biting reporters like his predecessor.